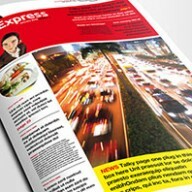 My InDesign newspaper templates are professional quality and fully print ready. All my InDesign newspaper templates are easy to use, equally suitable for both beginners and professionals. Whether you're looking to create a high quality publication using the supplied layouts or use the supplied pages as a starting point for a larger project. Please select a template to view a full preview and download options.